So, this is a site about camping, right? My last two posts have not had much to do with camping, but more to do with how I came to enjoy the sights and scenery between Tennessee and Texas. This will be my final “Back in the day…” series post, but the first on my experiences at beautiful Petit Jean State Park near Morrilton, Arkansas. Petit Jean is situated near the Arkansas River between the Ozark and Ouachita Mountains, about an hour northwest of Little Rock in central Arkansas. The park was built by the Civilian Conservation Corps in the 1930s. At Petit Jean, the CCC worked to create cabins, facilities, roads, and several amazing hiking trails, which provide visitors an opportunity to view what Native Americans and American Pioneers saw more than three hundred years ago. The natural features of this park are so numerous and great that I’m going give you the gory details in future posts. Yes folks, gory details! This beautiful mountain gets its name from an 18th century French girl, whose fiancé was heading out on an expedition to what was then the Louisiana Territory. Upon hearing this, Petit Jean cut her hair, disguised herself as a boy, and got a job on her fiancé’s boat as a cabin boy. While on the expedition, Petit Jean became ill near the mountain that now bears her name. Before she died, she revealed her true identity to her fiancé. She was buried on the mountain with the name she had assumed on the ship, “little John” (Petit Jean). The official Petit Jean website has much greater detail of the legend of Petit Jean, as well as the history of the park’s development. 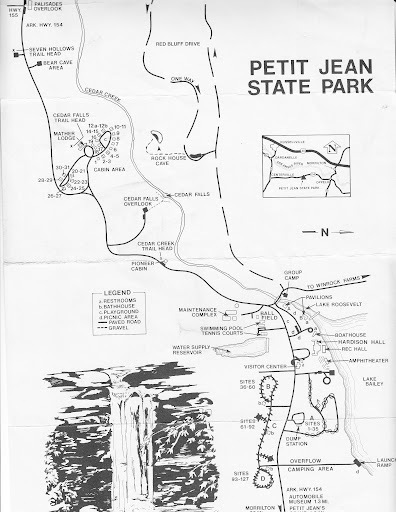 I got my first exposure to Petit Jean around 1984 or 1985, during summer and winter stays with my dad in Texas. To the best of my recollection, this was also the place where I got an introduction to camping. Petit Jean was just far enough away between Houston and Memphis to allow us to stretch our legs for a day (or week) or two. My sisters and I would hike the trails with our dad, learning about nature, self-reliance, and “roughing it”. Our camps were never really that rough, but several times I remember wondering if we would EVER make it back to civilization….alive. Still, our many camping trips to Petit Jean over the years brought us closer together as a family, especially my sisters and I. I have a sneaking suspicion that this outcome was a sole purpose of these trips. Living a transient life is difficult, even more-so when you’re a product of divorce. Our time on the trails of Petit Jean forced us kids to have each others back, and this continued when we were away from the trails. It still continues – more than 25 years later. So, it should come as no surprise that many of my most vivid and favorite memories “back in the day…”, revolve around these trips to Petit Jean. Several times, my grandmother went along for the trips, as did my stepmother and step sisters. In 1986, my dad, grandmother, sisters and I watched Haley’s Comet from atop Petit Jean Mountain. I have recently found some great pictures of these trips, which I’ll present in future articles. 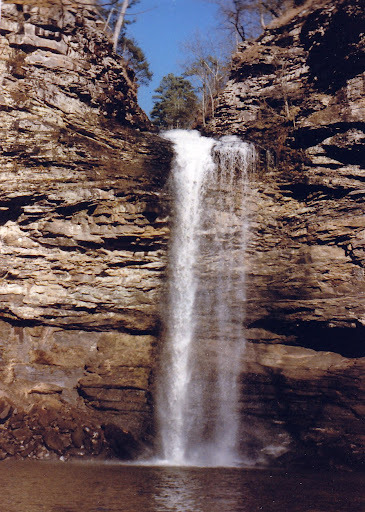 My last trip to Petit Jean was more than 15 years ago, in 1996. This was also the last time I went camping. Fortunately, I won’t have to wait that long to get back there. Later this spring, I’m going to introduce Joe to camping in the same way I was introduced to it by my father – with a trip to Petit Jean. My dad is meeting us there, which will make this trip even more memorable. We are all really looking forward to getting back together and back to the basics for a few days, Petit Jean style.